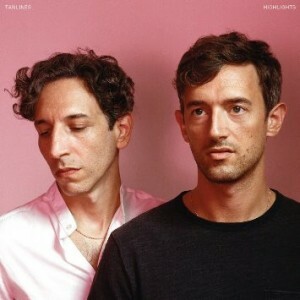 It’s no secret that we are wild fangirls and fanboys (ok, mostly fangirls) of Eric Emm and Jesse Aaron Cohen nor is it a secret that Tanlines‘ debut album Mixed Emotions landed on our Best of 2012 list. But let it be known, Tanlines have traded in their summertime tribal vibes for more straightforward electro pop on their second effort. The calypso dance beats on Mixed Emotions that you feverishly danced to on Saturday night have been supplanted by the Sunday morning laid back party-recovery grooves on Tanlines’ follow-up album, Highlights. And you know what? We’re ok with that. Highlights opens strong with “Pieces,” one of the first songs Tanlines started premiering on tour last year and “Slipping Away,” which transports you all the way back to the 1980s within the first few seconds of the opening guitar riff reminiscent of The Vapors‘ “Turning Japanese.” Both songs ease you into the new album but still give a nod to Cohen’s catchy rhythmic construction. Most unexpectedly of all is the noticeably downtempo nature of this album with “Two Thousand Miles,” “Running Still,” and album closer “Darling Dreamer.” Much like the dramatic close to Mixed Emotions with “Nonesuch,” Highlights similarly closes with a power ballad with Emm desperately bellowing to his beloved darling love “please, wait for me.” Overall, a solid record, but die hard fans will be missing the tropical feel from these Brooklyn boys.